I remember discovering Sephora for the first time in the late '90s, back when the only stores were in New York City and I had to place online orders using my dial up internet. Ever since then, I've been hooked on so-called "high end" makeup. But in and amongst my many trips to Sephora and Nordstrom, I've discovered some real gems that I absolutely love at the drugstore. The difficulty I find with drugstore products is the inability to swatch them in advance or to get samples to test before taking the plunge and making a purchase. But hopefully this will give you an insight into a few products that I have put through the ringer and absolutely love--in some cases more than their higher priced counterparts! Foundation: For the summer months, I prefer a foundation with light coverage and a matte finish (I find that medium/high coverage foundations with a matte finish are too mask-like and cakey for my taste). On the higher end of the spectrum, Givenchy Éclat Matissime is a great option with excellent lasting power. I didn't even know this foundation existed until a few months ago, but it's quickly become a favorite. The packaging can get a bit messy, but overall it's an excellent foundation. With that said, I probably enjoy my Bourjois CC Cream even more. I can apply this with just my fingers and it has the most beautiful finish. It probably gives a tiny bit more coverage than the Givenchy, but it doesn't last as long. But if you use a good primer and touch up with a powder, this foundation will see you through the day. Daytime Serum: Chanel Le Jour de Chanel is meant to invigorate the skin and add radiance, but it's real selling point for me is that it contains salicylic acid. The salicylic acid is meant to help gently exfoliate the skin and minimize the appearance of pores. Since I started using this product, I've definitely noticed a difference in my complexion. I apply it underneath my primer and it doesn't affect the appearance or longevity of my foundation at all. At $85, it is pricey but a bottle of this has lasted me absolute ages! But if you are looking for a cheaper alternative, the Juice Beauty Blemish Clearing Serum is a great alternative. This serum claims to reduce breakouts, unclog pores, and even skintone. It also has salicylic acid and CoQ10, which apparently promotes cellular turnover. Like the Chanel, this works well under primer. Mascara: Mascara is the one category where I implore you to go to the drugstore. There are so many brilliant drugstore mascaras out there. 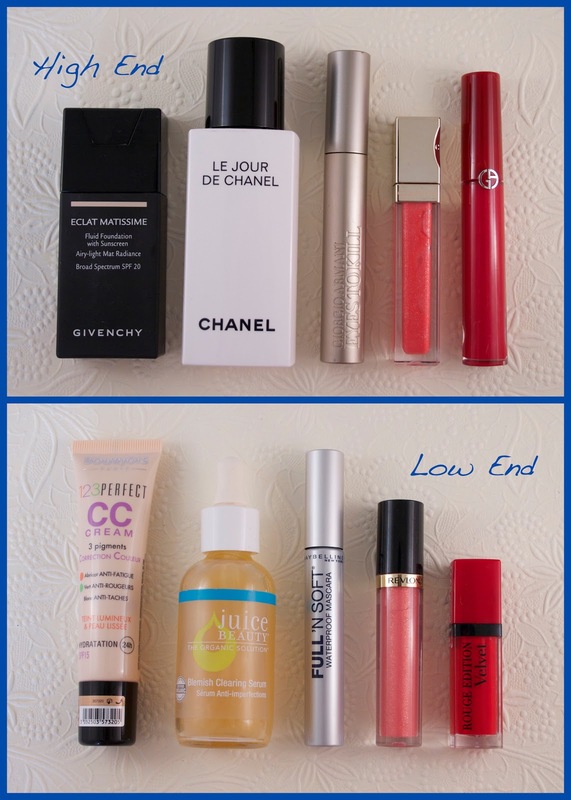 I consistently prefer mascaras by Maybelline, Covergirl, and L'Oreal to those by Dior, Chanel, or YSL. For the sake of this post, I had to choose a high end mascara and the only one I've ever repurchased is the Giorgio Armani Eyes to Kill Stretch. It gives great length and has an almost glossy finish. Plus, the packaging is quite luxe with a weighted wand. At a fraction of the price, Maybelline Full n' Soft Waterproof offers both great volume (with nary a clump in sight) and the ability to hold a curl. With my eyes being both small and hooded, curling my lashes is my only chance at having my eyes look remotely open. This waterproof formula holds the curl well and it manages the feat of not flaking, but not being impossible to remove at the end of the day. Lipgloss: Clarins Gloss Prodige is one of my favorite glosses for its high-shine, non-sticky formula and beautiful shade range. The Clarins glosses manage to have the most beautiful shimmer throughout, without any of the gritty glitter feeling on the lips. And since they are quite thick (but not sticky), they have excellent staying power. The Revlon Superlustrous Lipglosses are one of the most popular items at the drugstore, and with good reason. The range has every color you could possibly want and the formula is awesome. Like Clarins, Revlon knows how to make a good gloss. Liquid Lipstick: Giorgio Armani Lip Maestro are one of the OG liquid lipsticks, having been around for quite a few years at this point. Being exceptionally pigmented, they aren't for the faint hearted. But while I love the velvety finish of the Lip Maestros, they do have a tendency to slide around the face. The Bourjois Rouge Edition Velvets, on the other hand, have exceptional lasting power. These will stay on your lips all day long and then some. The lasting power seems to derive (in part) from the fact that they are a bit drying on the lips. But they are so gorgeous that it's totally worth it. What products do you love at the drugstore? What are you willing to splurge on? Feel free to head over to Bloglovin, Twitter, and Instagram to follow me!